Synopsis: Chester the Cat (a very large calico cat) has taken over one of Mélanie Watt’s books to hilarious effect. Even the copyright information page is filled with funny asides by Chester. The feline contributions appear to be in red marker on notebook paper with Mélanie Watts’ comments appearing as if on sticky notes throughout the book as she attempts to get her hijacked book under control. Readers will wonder throughout the book if Mélanie will ever get her book back, while absorbing lessons about how to write stories (without realizing they are learning). For instance, when Chester starts writing a story that’s exactly like a well-known fairytale, Mélanie explains plagiarism to him by simply stating that you can’t just use someone else’s story. NOTE: Mélanie Watt is the author/illustrator of the very popular Scaredy Squirrel series. Activities/Resources: There are a couple of ways kids could be challenged to write and illustrate their own stories after reading this book – either simply to produce their own picture book, or to imagine what their pet would write were he/she to do what Chester did. In looking for activities online, I discovered a wonderful website, Books4Learning. Here’s a blog post about all the Chester books (Yes! There are more!) with activity suggestions for Chester’s Masterpiece. Availability: Available in hardcover, online or through your local independent bookstore. This sounds like a great pairing with Susanna’s book choice this week- the new book Little Red Writing! I haven’t seen this one, Beth, thanks for sharing it. It turned out there was quite a spontaneous, serendipitous writing theme this Friday! Thanks, Wendy. I sure do wish I could take over some of Mom’s books! I can see it now, “Cupcake’s Masterpiece!” Yay! Sometimes, the pets need to take matters into their own paws…. I sense a theme going on here at PPBF. I guess I’d better get off the internet and get writing (after I check out some of these great book suggestions!) Thanks. Definitely a theme, totally unplanned. It’s uncanny how that happens in PPBF. Yes, me too! So interesting that there are three books on writing posted on PPBF! Good one! Thanks, Jarm! Themes are fun, especially unplanned ones! I haven’t seen this book, but I love what you said about the book! A hijacked book — wonderful idea. And Chester sounds like a lot of fun! Several books today have encouraged kids to write books today. Did you see Erik’s blog yesterday about the 8-year-old. Good example. Love books like this. Wish I had this encouragement as a child. This book is such fun! And encouraging kids to write is such a great thing. Isn’t it good that things have changed since we were kids, in this regard? Very clever book. Love the idea!…lol. I just love these spontaneous theme days! Definitely twilight zone-ish. You will LOVE this book. What a clever and fun idea, Beth. I’m definifitely ordering this. I love this book. Chester is my sort of cat! You will absolutely LOVE this book, Erik! Ha! I love Chester! My kind of cat. 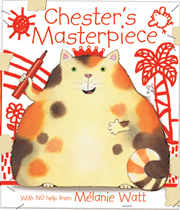 That Melanie Watt writes some funny books with the help of Chester! And Scaredy Squirrel is a favorite around here. Chester is such fun! I must find the other Chester books and read them. THis book sounds so cute. I can see my cat wanting to do that. I may buy it but not show it to her. I need to get this for my miao kitten library! it looks purrfectly enjoyable and educational for kittens.